Did you know that the top 3 most common New Year’s resolutions are to lose weight, get organized, and spend less/save more? Let’s knock two of those out of the park with some info on how to get the best nutrition at the best prices. First let me tell you that I don’t love the term “superfood” – I think “fadfood” would probably be a more accurate term. For instance, Kale is an awesome and healthy food, but when you compare the availability of nutrients contained in a food vs the number of calories in that food, you get a nutrient density score. Kale has a decent score of 49.07, but its less appreciated (and often less expensive) cousin Romaine lettuce gets a score of 63.48! Lowly Parsley gets 65.59! Don’t don’t worry if you can’t fill up your cart with Kale, Acai, Organic Blueberries, Tri-color Quinoa, and fresh wild Salmon — you can still eat great and pay much less without those trendy items. Below are some of my favorite substitutions and tricks when my wallet is feeling the squeeze. –Instead of salmon, try tuna for some good fats. Canned tuna in oil has 1 gram of saturated fat but also 2.5 grams of unsaturated ‘good’ fat. Water-packed tuna is low in calories while offering generous amounts of lean protein, omega-3 fatty acids, B vitamins, selenium and vitamin D. Canned tuna counts toward the recommended minimum of two servings per week of fish. –Instead of quinoa, turn to barley, oats and brown rice. All three of these amazing grains are less expensive than quinoa and often sold in bulk for additional savings. I love oats and barley because of their special fiber: beta glucan. It’s good for your heart, and new research shows that it helps you feel full longer, so you’re less apt to overeat. 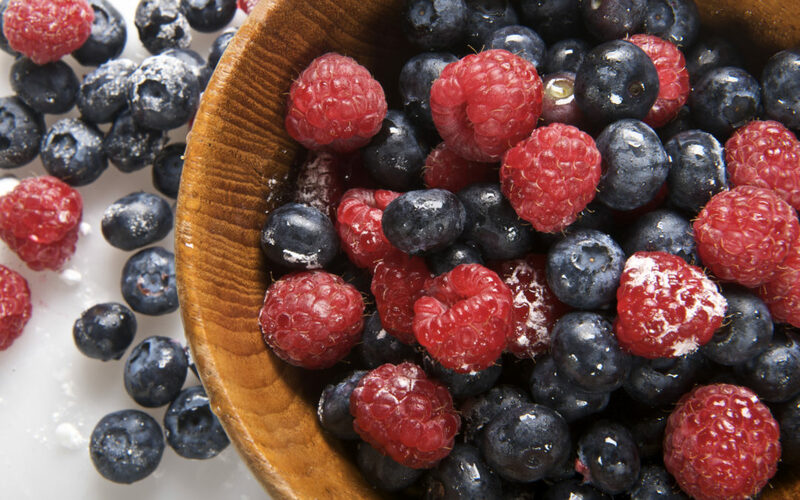 –Instead of fresh berries, look for sales on store-brand frozen berries. When in season, they’re also often a great deal at the farmers’ market. Or, just buy inexpensive bananas for your fruit fix; they are high in potassium, vitamin B6, fiber and vitamin C.
–Instead of kale, choose ANY leafy green that’s on sale, such as mustard greens, collard, Swiss chard or turnip greens, leaf lettuce or even romaine or parsley. Variety is the spice of life, and all leafy greens are really healthy choices. –Don’t even bother with “superfood” juices (açai, pomegranate, blueberry, etc.). Swap out sugar-filled juices (as well as sodas and sports drinks) for water, and add some sliced oranges, lemons, cucumbers, watermelon, strawberries, or even fresh herbs or a cinnamon stick to the pitcher for flavor. –For nuts, shop in bulk or pick a store brand. Also, if walnuts and almonds are out of your budget, peanuts can be cheaper, and if they’re unsalted, they are a great nut pick. –Instead of “superfood” meats (bison, emu, grass-fed beef), just stick with affordable poultry, such as chicken breasts bought in bulk. Or eat eggs, which are inexpensive yet protein-rich and high in heart- and brain-friendly omega-3 fatty acids. Alternative inexpensive proteins include cottage cheese, organ meats such as liver, cheap cuts of meat (cooked in a slow cooker to make them fork-tender) and tofu. –Dried beans are also budget-friendly. With both protein and fiber, they can be added to soups, salads, or nearly any dish. I recommend black beans, which have three times more heart-healthy omega-3 fatty-acids than other legumes. –Get your veggies on ice. Frozen vegetables are frozen at their peak freshness and retain more nutrients than canned varieties. A bag of frozen mixed vegetables and some lean protein can easily become a stir-fry, served with brown rice for a healthy, low-cost meal. –Cook in a crock. Lack of time to shop and cook is a huge obstacle to most working people, myself included. Slow-cooker meals are a great make-ahead option. They also make less expensive cuts of meat tender and delicious. What’s more, slow cookers are cheap, starting from $15 for a new, family-sized cooker, and they’re often available at thrift stores, too. –Think beyond boxed. A loaf of whole-grain bread, some peanut butter and bananas can be purchased for about the same as a box of sugary cereal. Serve your kids, and yourself, toast with peanut butter and bananas instead of a bowl of brand-name cereal for breakfast and they will have protein, fiber and potassium to keep them fueled longer. –Layer your lunch. Add a half cup of brown rice to a bowl, then layer on a variety of fresh or thawed vegetables, and top with protein (poultry strips, nuts, egg, canned fish or beans) for a cheap and easy meal. I hope these tips and tricks help you out. I’d love to hear of any of your own personal suggestions. Head over to my Facebook page and share them there so everyone can see!